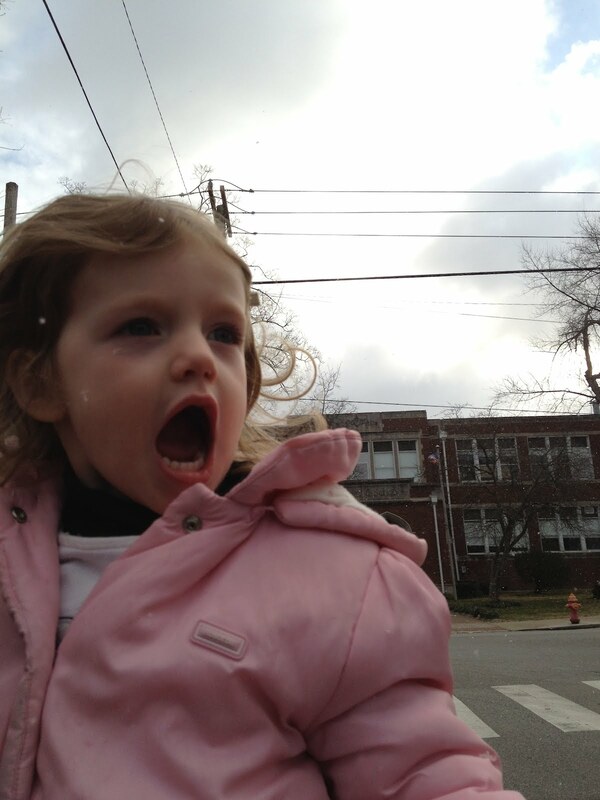 These pics are from February 7th-11th. A lot of days she’s been taking her Bible to school with her. 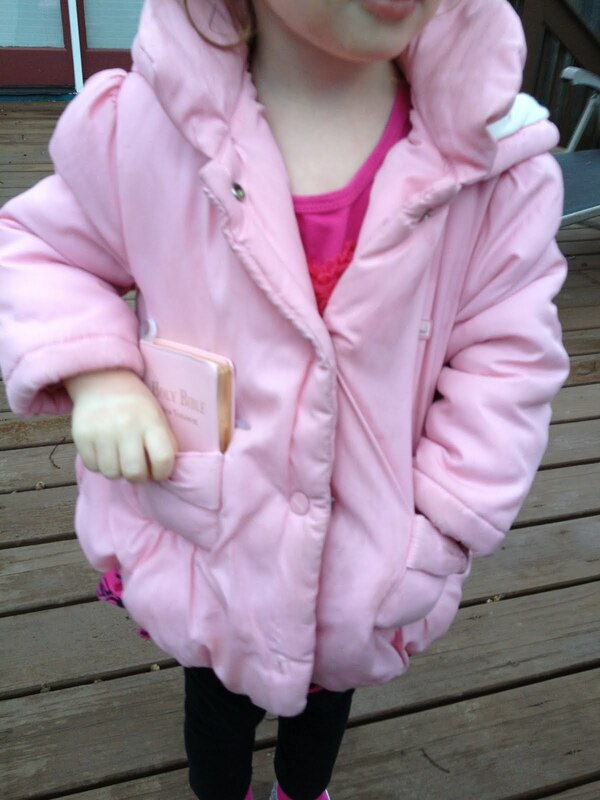 I think she really likes how it fits in her pocket so well! 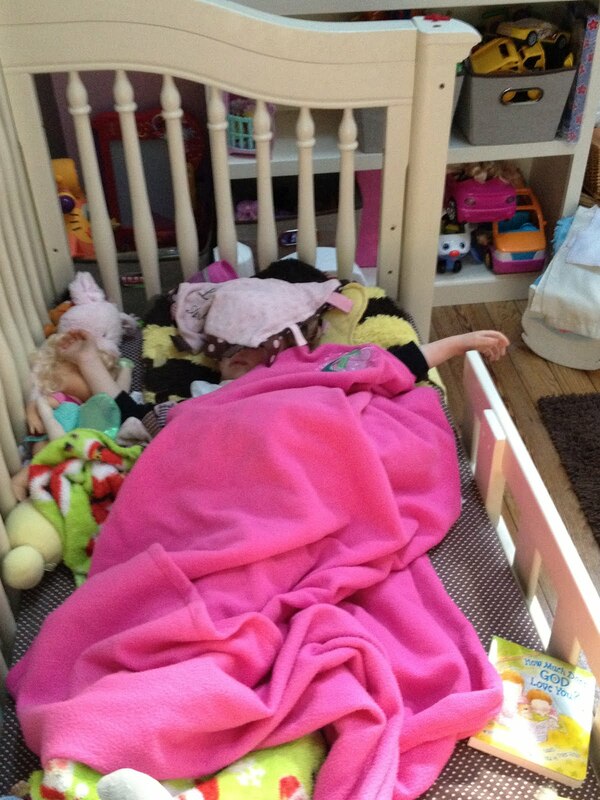 She has to leave it in her cubby all day but that doesn’t seem to bother her. 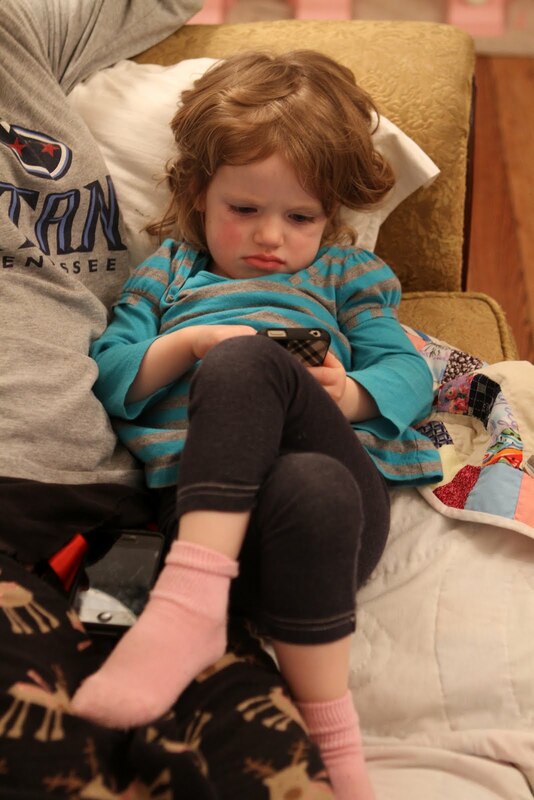 This was the time period when I got really sick and was home for several days. In the evening my buddy kept me company. 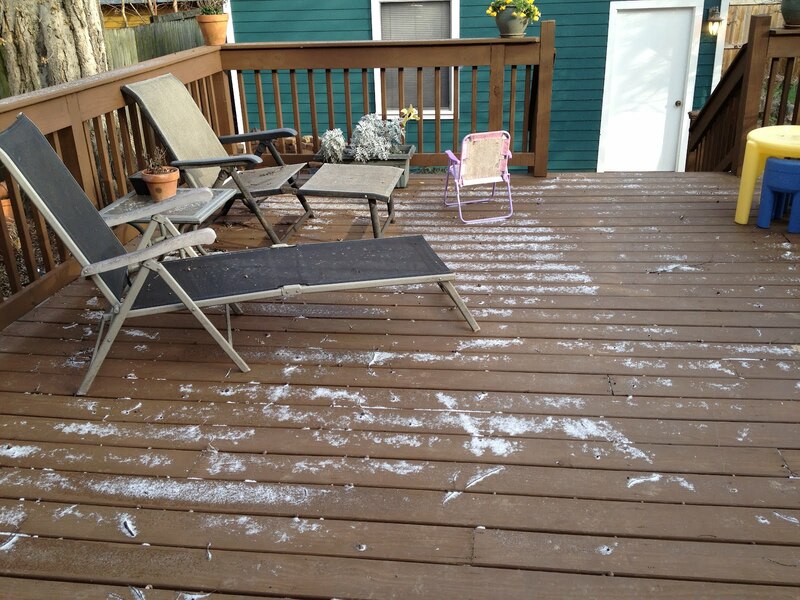 Overnight on Friday we got “snow”. Sadly this is the most accumulation we’ve had all year. 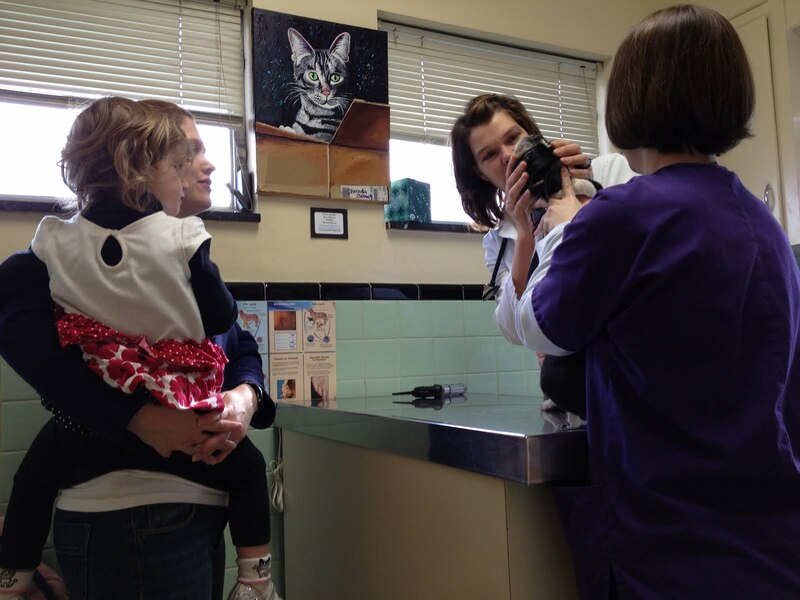 We already had an appointment to take Pippin to the vet for his annual check-up, so we went in the flurries over to the vet. 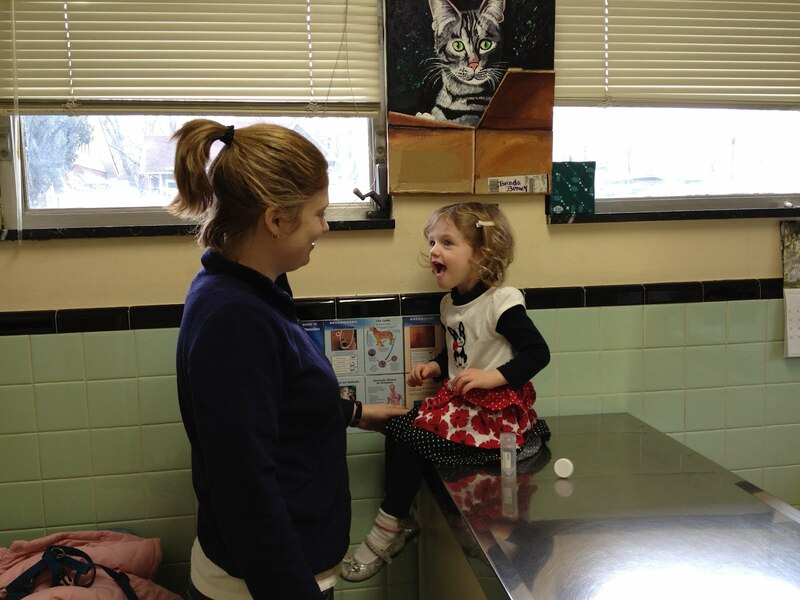 For some reason she just loves going to the vet. Actually Pippin does, too. He was wild and crazy the whole time and they have a difficult time checking him out because he’s working to lick them so hard! Dr G gave him a full exam and looked at a couple of little lumps that have popped up the last few months. Only one of them looked potentially concerning to her, so we’re dropping him back off sometime in the next few weeks to go ahead and have all of them removed, and have his teeth cleaned. They did more extensive than normal bloodwork on him, because of his cancer from last year, and everything came back normal! All his iron and other metrics were all perfect! Afternoon nap. Not even sure how this could be comfortable! That night we went out to eat at Cori’s Dog House. 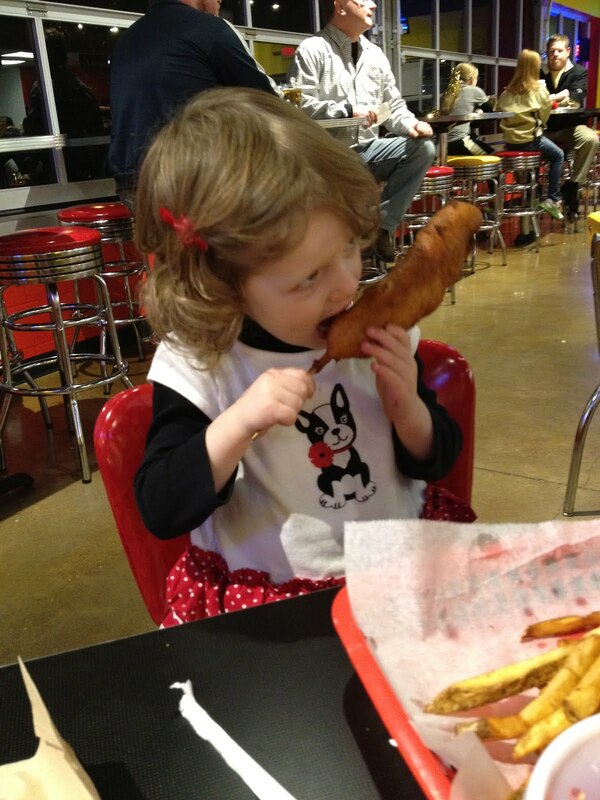 Their kid’s corn dog was massive! It was our first time there and overall it was really good. They literally have any and every type of hot dog topping you could imagine. 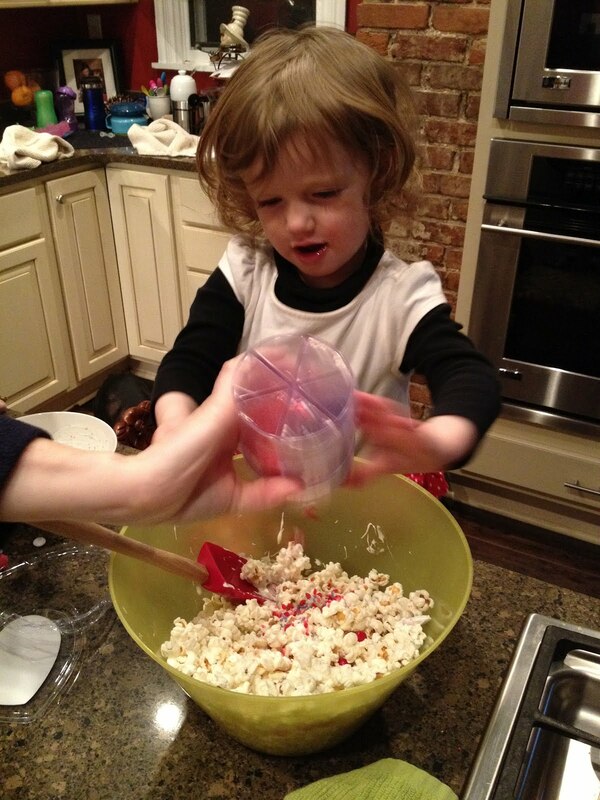 We made some white chocolate Valentines popcorn for her teachers. 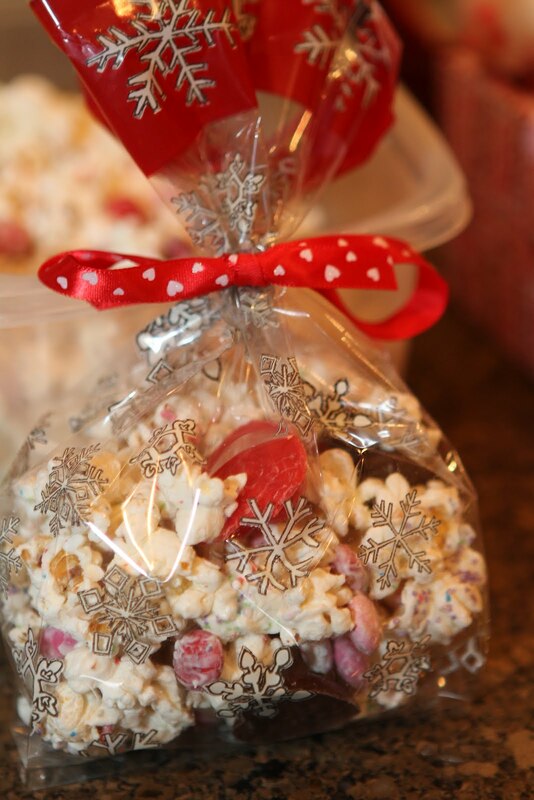 It’s very simple popped popcorn with white chocolate melts and sprinkles. I also threw in Valentines M&Ms, candy corns and made some heart chocolates with molds. 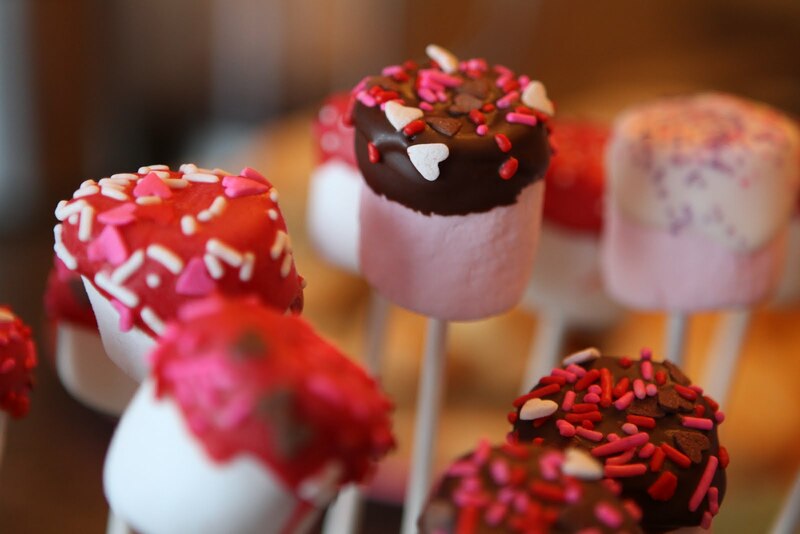 We also dipped some Strawberry Marshmallows in Valentines goodness! We wrapped it all up in bags and ribbon. One of my goals this year is to use more ribbon! I think between Lil’s birthday and Valentines I’ve emptied about 5 spools already! 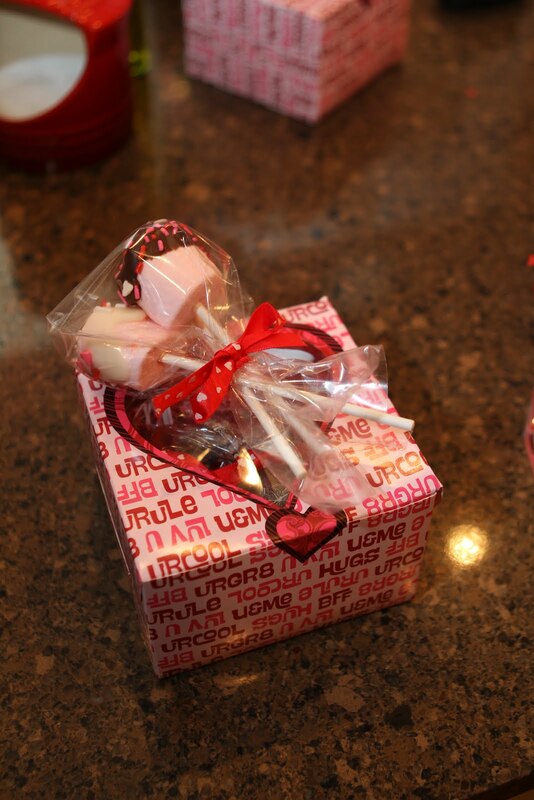 And then we put some Valentines cookies and the popcorn in little boxes and attached the marshmallows on top. They turned out so cute!!! So glad it’s the weekend! It’s been a long and busy week and I am looking forward to the weekend and maybe getting some rest.